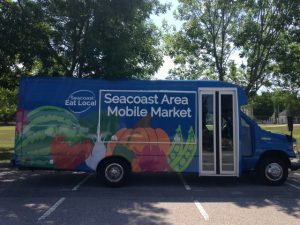 SAMM, the Seacoast Area Mobile Market, is the first mobile market program of its kind in New Hampshire, and is the newest program in a larger Mobile Market consortium that spans New England and is generously funded by the Harvard Pilgrim Health Care Foundation’s Healthy Food Fund. The goal of SAMM is to provide access to local foods in communities within our service region that may lack farmers’ markets of their own, have high concentrations of low-income or at-risk residents, are designated as being at higher risk for food insecurity, or have a reportedly high number of residents with lack of access to consistent means of transportation. In addition to these community stops, SAMM will also service a small number of employers in our region as an employee benefit. Aligning with our goal to provide greater access to local foods in all of our Seacoast communities, SAMM is also aimed at spreading and increasing the number of sustainable agricultural businesses in these areas. By sourcing product as locally to market stops as possible, we hope to incentivize and support small scale agricultural businesses in their growth. In similar fashion to Seacoast Eat Local’s SNAP program at farmers’ markets, SAMM accepts EBT/SNAP benefits for purchases and also runs incentive programs that are aimed at helping low-income individuals stretch their dollars at markets and purchase more fresh, local and healthy food. 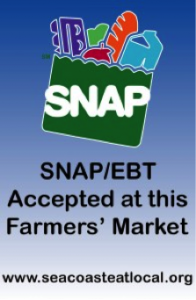 SAMM accepts SNAP tokens as well as Granite State Market Match (fruit and vegetable coupons) that SNAP customers may receive at traditional markets. Rather than receiving matching coupons for purchases, SAMM customers receive an automatic 50% discount on purchases of fruits and vegetables. SAMM is made possible by generous gifts from the Harvard Pilgrim Health Care Foundation’s Healthy Food Fund, as well as by a grant from the New Hampshire Charitable Foundation’s Thomas W. Haas Fund. We are grateful and humbled by the confidence that our funding partners place in our work and mission. To learn more about Harvard Pilgrim’s Healthy Food Fund, visit their website. More information about the initiatives of the New Hampshire Charitable Foundation may be found through this link.